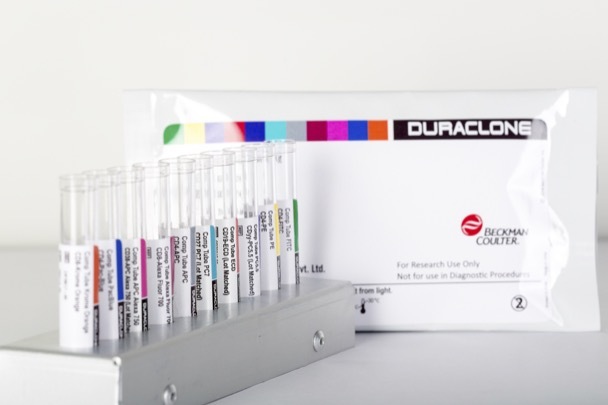 The DuraClone B27 Reagent Kit comprises a two-color, immunofluorescence stain, suitable for detecting the HLA-B27 antigen expression in erythrocyte-lysed, human whole blood samples (for example, a lyse and no wash protocol), using a flow cytometer. This reagent is not intended to be used to determine the HLA-B27 tissue group. The Human Leukocyte Antigen (HLA) B27 is a Class I surface antigen encoded by the B locus in the major histocompatibility complex (MHC) that presents microbial antigens to T-lymphocytes. The onset of seronegative spondyloarthropathies that include ankylosing spondylitis, Reiter's disease, psoriatic arthritis and inflammatory bowel disease are associated with the expression of HLA-B27 antigen on T-lymphocytes. Screening for HLA-B27 is thus of clinical relevance in conjunction with the symptomatic presentation of the disorder. Micro-lymphotoxicity tests are conventionally used in HLA-typing but are time-consuming and expensive. Flow cytometry has gradually evolved into a faster and reliable method for screening samples for HLA-B27 antigen. T-lymphocytes selected through gating of the CD3+ specific population are analyzed for staining by HLA-B27 conjugates. It has been demonstrated that this pre- selection of T-lymphocytes increases the specificity of the test by eliminating the background attributed to other leukocyte populations. Another method of lowering the risk of false-positives is by the addition of an Anti-B7 antibody to the reagent cocktail. The Anti-B7 antibody competes with the Anti-B27 antibody for the B7 antigen and in this manner, suppressing the incidence of cross- reactivity of Anti-B27 antibodies to B7 antigens. The DuraClone B27 Reagent Kit contains two clones of the Anti-HLA-B27 antibody and an Anti-B7 antibody. The presence of these antibodies improves the specificity of the reagent. The Anti-B7 antibody binds preferentially to the B7 antigen, thus reducing cross-reactivity. The test result is a direct extrapolation of the fluorescent staining intensity of the HLA-B27 conjugates with respect to a cutoff value. A protocol, specific to BD Biosciences* instruments, is detailed in the B27 Reagent Kit IFU (Instruction for Use).